Cimarronin - Fall of the Cross is set during the slave trade period, when powerful countries were vying for slaves and journeying to other parts of the world to obtain them. With the help of some of the locals, they wage wars and take numerous slaves over the waters to sell for profit. Catumbuque and his men are captured on one of these slave raids and sold to a Spanish viceroy. There he serves the viceroy as he waits and plans his escape with his men. When Catumbuque finally breaks out of his enslavement, he and his men set the women and children free and rounded up the viceroy’s family. Instead of running back to their homes, Catumbuque and his men proceed to ally with their master’s enemies in order to kill him. Meanwhile, a samurai and his mysterious companion seek a dangerous woman and are drawing close to the mayhem that is about to get bigger and nastier. Cimarronin - Fall of the Cross’s art is detailed and professional. The dialogue is natural. Where it shines are the captivating fighting scenes, which capture the essence of the conflict and the style of the era. However, the story seems like a bog-standard tale of a former servant going for revenge against his master. Unless something different or unique is introduced to this tale, it is doomed to be clichéd and trivial. 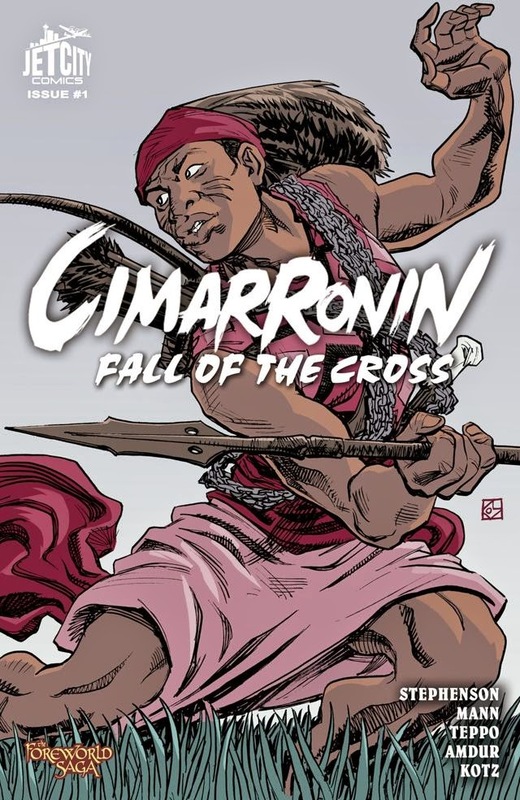 Cimarronin - Fall of the Cross is written by Neal Stephenson, Mark Teppo, Charles C. Mann, Ellis Amdur, Dean Kotz and published by Jet City Comics (March 25, 2015). Many thanks to Jet City Comics for review copy. All images are © to their respective owners.